In this game you are going to be the real sniper. Just use your gun and shoot to stay alive! Here you will have to join any room and show us all your skills. There are a lot of enemies and they are already here! Watch out! Stay alive as long as possible! Are you brave enough? Then choose the game and become a real sniper! 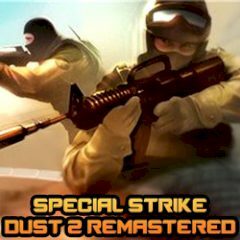 In this game you will have to join multiplayer battle on the famous dust 2 map with lots of different weapons. Could you believe that? Then just select your favorite team with unique weapon sets and try to get the highest score by the end of each round in order to win. Is everything clear? Then go ahead and explore these places. Everything depends on you. If you are ready, then take your gun and shoot! You will be the best sniper ever! Have much fun.